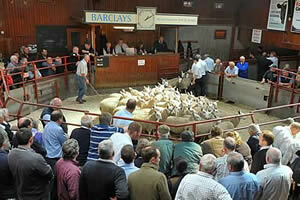 The Cumberland & Dumfriesshire Farmers Mart had forward 2,120 store hoggs at their sale at Longtown on Tuesday 4th January, 2011. A larger show and more buyers saw trade easily maintained. Top price of £83 for Beltex hoggs from Greenknowe; Rouge £79 Springwell; Texel £73.50 Linton House, £69.50 Bayldon, £69 Greenknowe and Lea Hill; Charollais £72.50 Rigg Heads; Suffolk £69 Lea Hill, £67 Cottage; Greyface £64.80 Haggistone Holm, £64.50 Wanwood Hill and Swinside; Hill Cheviot £57 Rue, £56 Linton House, £55.50 Wanwood Hill; Blackface £55.50 Swinside, £54 Balmurrie, £52.50 Silloans; Herdwick £51 Cottage; Swaledale £48.50 Allenheads. Feeding ewes to £52 Linton House.